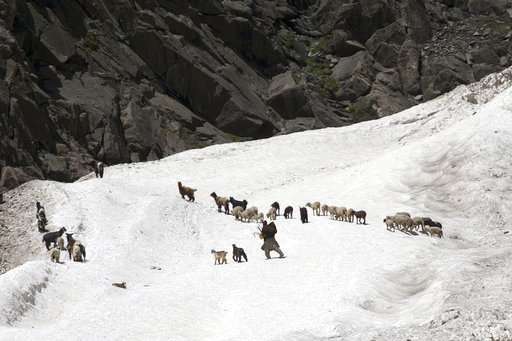 Scientists say one-third of the ice stored in Asia's glaciers will be lost by the end of the century even if the world manages to meet its ambitious goal of keeping global warming below 1.5 degrees Celsius, affecting water supplies for millions of people on the continent. In a paper published Wednesday in the journal Nature, researchers in the Netherlands also examined what would happen if average global temperatures rise beyond 1.5 degrees Celsius (2.7 degrees Fahrenheit) by the end of the century. They concluded that almost two-thirds of the ice in Asia's glaciers could vanish, if no effort is made to curb climate change. "In regions where glacier melt water is an important part of the river flow, the retreating glaciers can become a problem," Philip Kraaijenbrink, a University of Utrecht geographer who led the study, said. "There are many people living in basins that have their rivers originating in Asia's high mountains, such as the Indus, Ganges and Brahmaputra," Kraaijenbrink said. "In these basins, the river water is used for irrigation of cropland, drinking water and for hydropower dams." The 1.5-degree target was set at the international climate conference in Paris two years ago, but experts say it would require a massive shift to the world economy. In total, the researchers compared 110 climate simulations and found that high mountain glaciers in Asia tended to experience greater levels of warming than the global average. All glaciers analyzed already are losing mass except those in the Kunlun Mountains of western China. 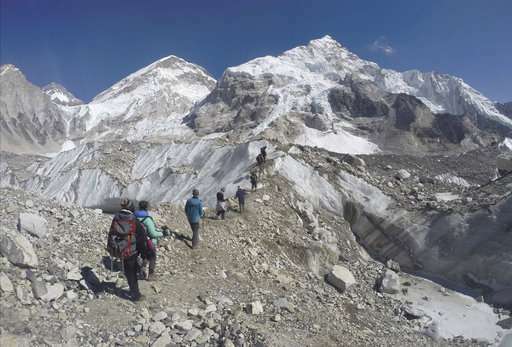 Taking into account the effect on melting levels of rubble covering some of the glaciers, they concluded that the amount of ice lost from Asian glaciers is almost proportional to the amount of warming they experience, though with some regional variations. "Even if temperatures stabilize at their current level, mass loss will continue for decades to come until a new equilibrium is reached," the researchers said. Kraaijenbrink acknowledged that a scenario in which global warming remains under 1.5 degrees Celsius is optimistic. "We are aware that more extreme, business-as-usual scenarios are possibly a more likely future," he said. In a comment published along with the study, J. Graham Cogley of Trent University in Canada said the researchers' glacier model "has some innovative features that might raise eyebrows among glaciologists, but it is difficult to find fault with it as a pioneering effort." "The authors have shown that achieving the 1.5 Celsius target will conserve a substantial fraction of Asia's water resources and that, if we fail in this regard, we will pay in direct proportion to the extent of the failure," Cogley said.